Wade out and look for fish darting in among the rocks. Challenge the kids to a splash-off (and maybe even let them win). Duck inside at the open-air snack bar for some shade and a quick bite. Gather each night for bedtime stories or board games until the little ones can't keep their peepers open another minute. Grab a kayak and paddle out, or kick back under a beach umbrella. You are steps away from the beach. 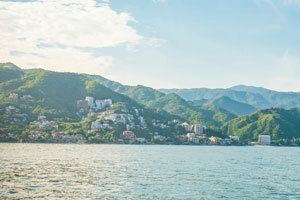 Shop, stop for a drink or just stroll the famous El Malecon Boardwalk, just a ten-minute ride away. Its classic terra cotta, wrought iron, Old Mexico vibe gives Lindo Mar Resort a touch of nostalgic charm. Go with it, channel your inner Ava Gardner or Deborah Kerr and make your way to the nearby abandoned film set from the 1960’s classic, Night of the Iguana. Back at the resort, laze the days away poolside or on the beach before strolling over to the oceanfront restaurant for the daily sunset happy hour. Your fully furnished one- or two-bedroom condo has a kitchen for making low-key family favorites. And the living room is tailor-made for movie nights when you might just make an exception to your normally strict no-snacking-on-the-sofa policy. Up early? Take that first mug of coffee out to your private balcony or patio and enjoy the peace and quiet before getting bombarded with breakfast-fixing and goggle-adjusting requests. And be sure to map out your week in advance so you can surprise the kids with horseback riding or a dolphin experience. This property is undergoing renovations from 22 June 2019 to 05 October 2019 (completion date subject to change). During renovations, all efforts will be made to minimize disturbance. Conchas Chinas gets its name from the Chinese Shells that can only be found on this beach. Located on the Pacific Coast of Mexico and just five minutes from downtown, this peaceful beach has calm waters that make it the perfect place to spend time with your family.